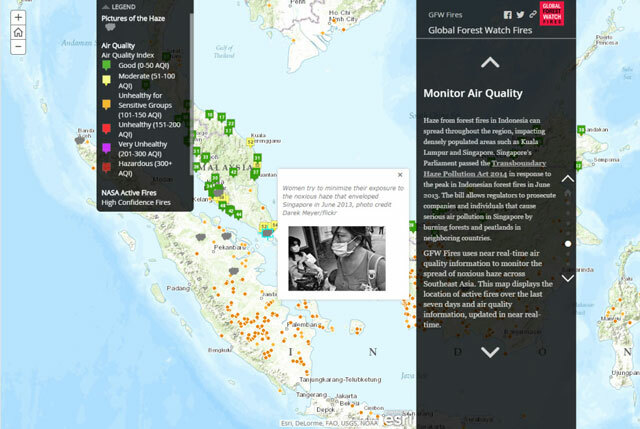 Global Forest Watch (GFW) recently launched a new story map highlighting the functionality behind GFW Fires, an online platform for monitoring and responding to fires in Southeast Asia. The story map walks users through the platform and explains its growing role in the fight against land and forest fires. Created using ArcGIS Online and the Map Journal Builder, the story map is organized into eight sections that users can scroll through. 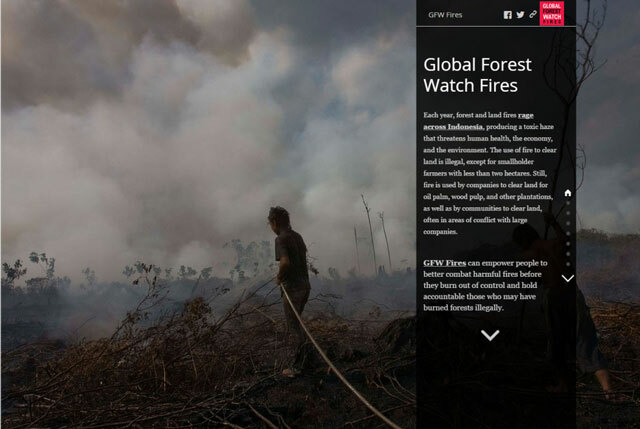 Each section highlights a different feature of the platform, and tells the story behind how it is helping government agencies in Indonesia and other countries monitor and respond to fires with more precision and speed. It also explores the environmental, economic, and social implications of these fires. From Digital Globe and Landsat high-resolution satellite imagery to wind and air quality data, the platform empowers people to combat these fires before they burn out of control and enables greater accountability where crimes of illegal burning may have been committed. To learn more about GFW Fires and how you can get involved, check out the GFW Fires Story Map and the GFW Fires platform today.